Awa-no-kuni was an old province of Japan at the southernmost part of the Boso Peninsula. 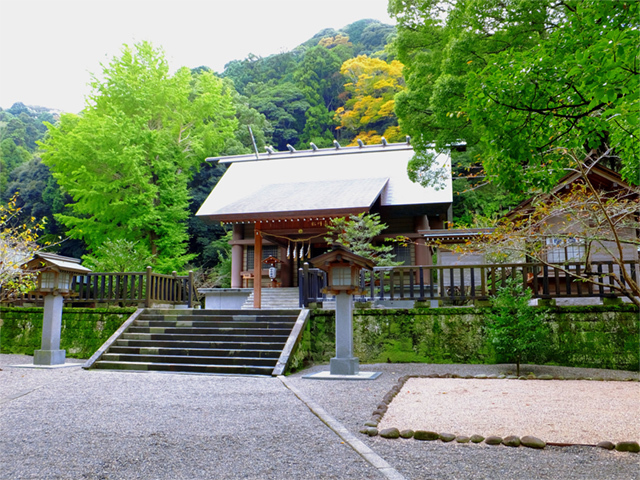 This old shrine was the Ichinomiya of Awa-no-kuni, the shrine with the highest rank in the province. Ame-no-Futotama no Mikoto, the ancestor of the Imbe clan, is enshrined here. Many old trees grow on the shrine’s vast grounds, giving it a solemn atmosphere. Along the road approaching the shrine are about 200 sakura cherry trees. This road and the area behind the Main Hall are famous cherry blossom spots.